The “two deaths” in the title of Phillip E. Wegner’s new book are the fall of the Berlin Wall in 1989 and the terrorist attacks of September 11, 2001. During the gap between these two events, Wegner finds a cluster of cultural possibilities, a flourishing of “what we might call a ‘late’ postmodernism that only emerges in the 1990s” (5). 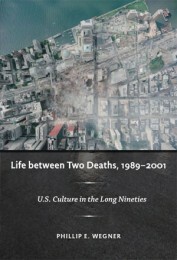 In Life Between Two Deaths, Wegner reads the 1990s as a “coherent cultural period” with an admirable critical distance, and his periodizing framework productively locates the 1990s as a transitional decade between the end of the Cold War and the emergence of our contemporary war on terror (9). As what Michael Denning describes as the “age of three worlds” wanes after 1989, theorists, writers, and filmmakers engage in productive struggles to articulate the United States’ role in a post-Cold War era. In those struggles, Wegner locates both nostalgic returns to Cold War logics of containment, nationalism, and messianic violence as well as utopian visions of the coming multitude, the commons, and queer belonging. The defining conditions of the 1990s, Wegner argues, are fourfold: globalization, new communication technologies, the “counterglobalization political movement,” and the “post-postmodernism” of theoretical enterprises in the 1990s, ranging from Agamben and Badiou to Butler and Jameson (33, 34). Ultimately, Wegner wants to foster an awareness of what has been lost since 9/11: not national innocence or a naïve sense of security, but instead the risk of revolutionary thinking. By returning to the 1990s as a site of possibility, Wegner hopes to find “how we might rekindle precisely the kinds of radical enthusiasms that seemed to be emerging with so much energy in days before September 11” (42). While Life Between Two Deaths does use historical events to bracket off its object of analysis—the 1990s—most of the book’s chapters deal with novels, critical theory, film, and television, with an emphasis on how those objects help us to imagine possible futures. Accordingly, the book’s analysis focuses on how ideology and utopia are represented in cultural texts, chiefly through the operations of allegory, Fredric Jameson’s favored way of linking fiction to history. Wegner’s readings of cultural texts often seize upon utopian longings and political complicity, and these visions of the future and the present are often contextualized as resolutions of contemporary contradictions, like residual American nationalism in the wake of the Cold War and the imperative to dissolve national boundaries to facilitate free trade within global markets. While this often feels justified, especially when Wegner reads a massively successful film like Independence Day (1996) in the context of the first Gulf War and the coming “war on terror,” it is less convincing that a novel like Don DeLillo’s Underworld (1997) has the same generative role in culture since it is, in terms of form but also in terms of material matters like circulation, far less accessible and influential than a wildly successful Hollywood commodity. For a book concerned with form’s theoretical valences, Life Between Two Deaths does not address more pragmatic formal qualities like circulation, modes of publicity, and material conditions of reception. Despite this quibble, the book practices a cultural studies methodology admirably, and Wegner adeptly reads both fiction and theory together, allowing them to inform and amend one another in productive ways. His use of Judith Butler’s work on kinship, for example, informs, but is also informed by, the TV series Buffy the Vampire Slayer (1997-2003). Jameson’s writings on naturalism are juxtaposed with the films Fight Club (1999) and Ghost Dog (1999), which results in a reconceptualization of naturalism in the 1990s as projecting a ressentiment that predicts the suppression of anti-globalization struggles. In opposition to Michael Denning’s view that “cultural studies in now in crisis or in question . . . because its moment, the age of three worlds, is over,” Wegner’s book presents a series of readings that do endow cultural texts with political power (10). Wegner develops a cultural studies framework that privileges utopia and desire, and this mode of cultural studies differs from Denning’s method of championing low or populist culture against elite canons. Life Between Two Deaths demonstrates the vitality of theoretical discourse today, especially because, in Wegner’s methodology, theory and fiction both perform critical, theoretical work. Wegner is writing within the tradition of critical theory established by Fredric Jameson, and like Jameson, he often looks back to the Frankfurt School, especially Walter Benjamin and Ernst Bloch, as theorists also interested in reading the dialectic of ideology and utopia in cultural artifacts. Also embedded within the book’s framework of “two deaths,” however, is the psychoanalytic concept of repetition. The Berlin Wall and the destruction of the World Trade Center do not just mark transitional moments for the U.S.; Wegner proposes that they have a deeper, symbolic relationship. Wegner reads DeLillo’s Underworld, for example, as cementing the World Trade Center’s role as an icon of Cold War nationalism and U.S. hegemony in a way that predicts the towers’ destruction. Echoing other theorists like Jean Baudrillard and Slavoj Zizek, Wegner views 9/11 as a repetition, as an image as well as an event, and in Wegner’s analysis, the fall of the twin towers forces the true recognition of the end of the Cold War: “The toppling of the World Trade Center buildings can be understood as a form of second death, an incident that repeats an earlier fall, that of the Berlin Wall in November 1989. The first fall was a true event: unexpected, unplanned for, an encounter with a Traumatic Real” (24). Wegner tries to bridge the old theoretical gap between psychoanalysis and Marxism by fusing Lacan with dialectical materialism, yet the result of this attempt at theoretical synthesis between the inside and the outside, the subjective and the historical, ultimately results in a very schematic model of both discourse and history. Like Jameson, Wegner has a fondness for Greimas squares, yet the historical narrative in Life Between Two Deaths seems to be too much of a narrative—too easily contained by a beginning, middle, and end. I found myself wanting some Deleuzian or otherwise anarchic energy to disrupt the schematic elements in the periodization of the 1990s. Building on his earlier book, Imaginary Communities: Utopia, the Nation, and the Spatial Histories of Modernity (2002), Wegner turns to science fiction as a site for the imagination of possible futures. After two chapters on periodization that include the reading of DeLillo’s Underworld, the book has two halves: the first, on films that do not manage to imagine a future different from the 1990s, and the second, on novels and a television series that do offer some alternative trajectory. What unites the “bad 1990s” texts, to put it crudely, is an inability to think past current modes of production except through apocalyptic events. Elaborating on Jameson’s claim that “it seems easier for us today to imagine the thoroughgoing deterioration of the earth and of nature than the breakdown of late capitalism,” Wegner finds in films like Cape Fear (1991), Fight Club, Ghost Dog, Independence Day, and Terminator 2: Judgment Day (1991) a limit point against which their narratives flounder and, ultimately, retreat to tropes of masculine regeneration and national unity (Jameson xii). Alternately, the final two chapters are devoted to Joe Haldeman’s Forever trilogy (1974, 1998, 1999), Octavia Butler’s Parable novels (1993, 1998), and Buffy the Vampire Slayer. In Wegner’s analysis, these texts produce both “an effective critical engagement with the present” and, in the case of Buffy, an imagining of a queer mode of belonging that repurposes the family structure into a kinship network consolidated through friendship rather than bloodline. Alongside other recent books like Samuel Cohen’s After the End of History: American Fiction in the 1990s (2009) and David Greven’s Manhood in Hollywood from Bush to Bush (2009), Wegner’s Life Between Two Deaths contributes to a growing body of scholarship that finds in the 1990s a coherent cultural period as well as a site of possibility, repetition, and transition. As such, it provides a theoretical and historical framework that should be generative for further work on the decade, and this is most evident in the recurring tropes that Wegner features in his analyses that could become subjects of their own studies. For example, a recurring trope in 1990s texts is revitalized masculinity. Reminiscent of the 1890s and 1950s “crises” in masculinity, the 1990s becomes, in Wegner’s analysis, a period deeply ambivalent about masculinity’s utility. At once feminized by consumerism and reinvigorated by entrepreneurial energy, masculinity is a key site where films and novels work out the contradictions between Cold War militarization and New Left critique. Furthermore, there are lots of other 1990s movements that would relate to the political currents of globalization in quite different ways than those charted in Life Between Two Deaths. For example, Wegner does not address the importance of hip-hop and “alternative music” to mainstream popular culture, nor does he address the emergence of the “sincerity” aesthetic of Michael Chabon, Jonathan Lethem, and other writers associated with McSweeney’s Quarterly Concern. It seems that these movements and styles do not advance utopian imaginings as much as a reinvigorated realism, an aesthetic that might not produce visions of the future but instead rubrics for rethinking everyday life from within neoliberalism. In writing about a newly historical period, Wegner courts nostalgia yet never succumbs to it. Just when one expects to find, for example, a melancholic invocation of the 1999 Seattle WTO protests during a discussion of Hardt and Negri, Wegner exchanges Hardt and Negri’s “mulititude” for Etienne Balibar’s, which, to Wegner, foregrounds how open communication networks are a necessary condition of the Spinozist collective formation. Wegner does cite both Fredric Jameson and Bruce Robbins on the utopian promise of the welfare state, and in a section that seems a bit myopic now given the sad state of the humanities job market, he claims that Joe Haldeman’s novel Forever Peace (1997) should remind us that the university “is one of the few places already in our world where some degree might occur of unalienated labor” (191, emphasis in original). More development of these political gestures would be welcome, especially since it is unclear how Wegner would periodize our contemporary moment. In the book, neoliberalism seems to refer to the 1990s, especially the years of the Clinton presidency and the emergence of globalization, and after the “second death” of 9/11. Neoconservatism supplants neoliberalism as the U.S. engages in the “war on terror” and codifies the new “state of exception.” This sequence–from the Cold War to neoliberalism in the 1990s to neoconservatism after 2001–seems far too neat. Further, Wegner suggests that neoconservatism is facilitated by, rather than a negation of, neoliberalism. But, Life Between Two Deaths’s tentative invocation of neoliberalism seems indicative of the book’s ultimate persuasiveness, since it asks us to wonder if we are entering a new historical period or if we still live in shadow of the “two deaths” that ushered in the 21st century. Denning, Michael. Culture in the Age of Three Worlds. New York: Verso, 2004. Jameson, Fredric. The Seeds of Time. New York: Columbia UP, 1994. Daniel Worden is Assistant Professor of English at the University of Colorado at Colorado Springs. His work on U.S. fiction, television and comics has appeared in Arizona Quarterly, Canadian Review of American Studies, Modern Fiction Studies and The Southern Literary Journal, as well as the anthologies The Comics of Chris Ware: Drawing is a Way of the Thinking (2010) and Violence, the Arts, and Willa Cather (2007). He is currently completing a book manuscript titled Masculine Style: The American West and Literary Modernism and beginning a new project titled Cool Realism: The New Journalism and American Literary Culture.